SECURALL 60 Gal. 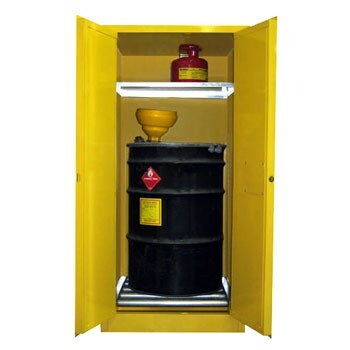 Horizontal Drum Storage Cabinets with Safe-T-Door are the safe and organized way to store Flammable Liquids stored in a 55-gallon drum. Horizontal Drum Cabinets store one 55-gallon drum on a drum cradle (sold separately) and one 5-gallon can. These cabinets meet all safety requirements for handling Flammable Liquids along with OSHA and NFPA (Code 30) regulations. Popular models are FM approved.